Seafood canning company Chicken of the Sea International is among the many companies responding to the multi-pack trend sweeping the grocery aisles. 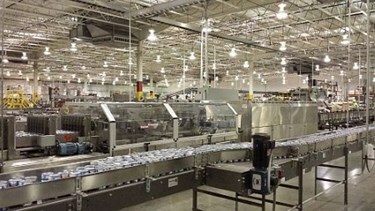 The California-based - company, which in 2014 is celebrating its 100th anniversary as an American food icon, decided it needed to add a bundling machine that could shrink wrap multiple cans into a package at its Lyons, Georgia plant. After reviewing the available options, Chicken of the Sea opted for the 597 Tritium Multipacker with Robo-Wand wrapping module, and 296 Continuum Tray Shrink packers, manufactured in the U.S. by Standard-Knapp. The new equipment lets Chicken of the Sea adapt to the particular pack styles required by various customers. Now the company reports that its new packaging equipment has helped increase production on the line by 50-75 percent, while reducing machine downtime significantly. Chicken of the Sea International, a provider of shelf-stable seafood, including tuna and salmon, opened a domestic canning operation in 2009 at a 200,000-square-foot facility in Lyons, Georgia. The Lyons plant employs 350 people, and produces about 36,000 cases of product a day. Over time, a larger and larger proportion of the product was being packaged into shrink-wrapped multi-packs, in response to industry trends. The plant had originally outsourced that capability but eventually reached the point where it needed its own bundling machine to shrink wrap a range of multi-packs on a new high speed packaging line it was installing. Indeed, as part of its Centennial marketing program, Chicken of the Sea expects strong sales of its tuna 4-packs highlighting a $1,000,000 giveaway to deserving non-profits across the U.S. The equipment ultimately selected was a 597 Tritium Multipacker with Robo-Wand wrapping module, and two traditional Continuum 296 tray shrink machines. Before making the decision Cox visited a plant that had installed the Standard-Knapp equipment, along with plant engineering manager Larry Hightower, PE, who is responsible for managing the plant’s capital projects and maintenance. They ran tests of Chicken of the Sea products, and had the opportunity to see the equipment in action. “Their equipment met both speed and cost requirements, is built for 24/7 operations, and is extremely strong,” noted Cox. What’s more, Cox liked the fact that the equipment is manufactured in the U.S with U.S. components, which he considers important, because he had dealt with both European and Asian packaging equipment in the past and found it difficult and expensive to get parts and service people. He also liked the fact that Standard-Knapp is an employee-owned company, with all its employees totally committed to putting out a quality product. The Tritium gave Chicken of the Sea the versatility it needed. The modular construction easily allows for future expansion to the system and allows for fast, easy change over. Each change part is specifically designed for the particular product and once installed the operator simply selects the desired product from the HMI and the now the machine is ready for production. The company now has the ability to feed the tray pack machine directly, and it can run separately from multi-pack. If they don’t need the multiple pack feature, they can now overwrap loose-packed cans. According to plant engineer Hightower, the ease of setup is one of the Tritium’s most important features. “The way the machine is designed makes it much easier to change over from one pack style to another and easier to change film from one type to another. In addition, the system automation and safety features are unique.” With the Tritium, the machine is fully protected to ensure the safety of the operator. Recovery is also much better, says Hightower. Since the equipment is servo controlled, if something crashes and there is a bad label or bad can, operators can clean and reset the machine, hit start and the machine is up and running immediately. On the older generation machines, the chain could jump and the mechanic had to do a lot more to get the machine up and running again. One of the features that most impressed Cox was the slide out film bed, which makes access and maintenance in the film cutting area much easier and quicker. With its slide out film bed drawer, maintenance is simple, and operators can quickly and easily recover from a jam. “Bundle packs are a pretty complex process, requiring the ability to change over sizes quickly, and add film safely and easily,” notes Cox. “A big part is ergonomics, because the rolls of film are so heavy, and the Tritium is equipped with a side film stand. Loading film is now safe and easy. In addition, it’s a modern machine that incorporates motors and programmable logic controllers, is equipped with proper safety stops, and gives the company everything we need to operate highly efficiently.” Hightower agrees, noting that the film bed is an excellent quality, with sensors monitoring the film ensuring it remains in the correct position, cuts consistently and fully wraps all packs. Another valued feature is the Zero-Gap II Infeed, which uses electronic sensors to monitor and control product movement, maintaining a constant low line pressure and maximizing machine uptime. The new infeed allows for positive grouping and escapement of product. Smoothly and reliably, the in-feed guarantees steady release of product, with no mispacks, tipping or crashing. New equipment increases production over 50 percent! According to Chicken of the Sea, the new equipment runs more constantly and is far steadier than any other tray packer in the plant, increasing overall line efficiency considerably. The Standard-Knapp equipment runs at efficiencies of over 95 percent, much higher than that of the other ancillary equipment required for the line, including stackers and palletizers. They estimate they are producing roughly 50-75 percent more product than was capable with their older machinery, all with a 20 percent manpower reduction on the line. The new Tritium machine has the ability to run up to 120 trays per minute and replaced a machine that was only running 20 packages a minute. Currently the machine is operating extremely well, with speeds of about 80 trays a minute, so there is room for expansion in the future. In addition, downtime over the course of the week has dramatically decreased. More changes are planned, with Standard-Knapp recently converting the film bed on an older piece of equipment at the plant to the new style film bed. For more information, visit www.standard-knapp.com.